With Few Signs Of Progress, Russia's Putin Warns Of Long Fight In Syria : Parallels "Terrorists in Syria pose a special threat," Putin says. "Many people there are from Russia, and if they win in Syria, sooner or later they will come to Russia as well." When Russia began its bombing campaign in Syria, Russian officials said it would be a short-term air operation. Since then, things have gotten messier. In his state of the nation speech Thursday, President Putin reminded Russians that it took nearly a decade to crush terrorists who staged attacks around Russia in the 1990s. He cast the fight in Syria in similar terms. Russia seems to be building up its military force in Syria, especially after Turkey shot down a Russian warplane along the Turkish-Syrian border late last month. 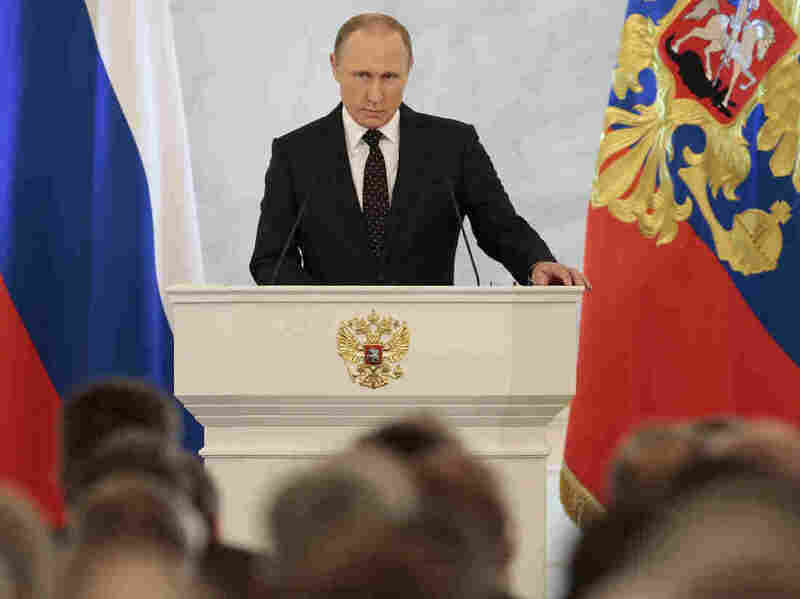 In his State of the Nation speech on Thursday, President Vladimir Putin warned the Russian people that the fight could be a long one. In late September, when Russia began its bombing campaign in Syria, it went in to support the regime of Syrian President Bashar Assad. Russian officials said it would be a short-term air operation, no more than a few months, with no involvement by ground troops. Since then, things have gotten messier. In his speech, Putin reminded Russians that it took nearly a decade to crush extremists who staged attacks around Russia in the 1990s. He cast the fight in Syria in similar terms. "Terrorists in Syria pose a special threat," he warned. "Many people there are from Russia, and if they win in Syria, sooner or later they will come to Russia as well and will continue with their terrorist activities here." The Russian leader may be preparing people for a much longer fight in Syria. One element that will complicate the mission is Russia's now openly confrontational relationship with Turkey. When Turkey shot down Russia's warplane on Nov. 24, the aircraft was striking groups that Turkey supports in Syria's north — ethnic Turkmen who oppose Syria's president. "From the Russian point of view, that Turkmen area was a military threat against the Russian airbase in Latakia," says Akin Unver, an expert at Kadir Has University in Istanbul. "So that's when Russia started to attack along with Assad's forces, on that key strategic point — and Turkey basically really disliked this because that was the only hurdle that prevented the Kurds from accessing the Mediterranean." Unver is talking about Kurdish forces in Syria who would like to capture the Turkmen area to control a strip of northern Syria along the Turkish border, all the way from its own region to the Mediterranean Sea. Since Turkey has a problem with Kurdish separatists on its own territory, Unver says, the last thing it wants is a Kurdish-controlled mini-state right next door in Syria. So, he says, one Russian strategy would be to help the Kurds gain control of the region. That would both eliminate some of Assad's enemies and deal a retaliatory blow to Turkey. Russian officials promised quick success because they were working with troops on the ground — government troops loyal to President Assad. But that might not be working, says Steven Pifer, an expert on Russia at the Brookings Institution. "The Russians have tried it with support for the Syrian armed forces," he says. "I'm not sure that's meeting thus far with a lot of success." Despite heavy Russian bombing coordinated with the Syrian army, Assad's forces have had a hard time recapturing the ground they lost to rebels over the past year. If Russia steps up the tempo of its bombing campaign, it also increases the risk of civilian casualties. Russia's airstrikes have killed more than 400 civilians since the bombing began, according to the Syrian Observatory for Human Rights, a London-based monitoring group. Pifer notes that the United States and other members of the Western coalition bombing Syria have restricted their targets to avoid hurting civilians. "The relatively small number of air attacks that you've seen by the West over the last months, much smaller than one might have expected, have been driven by the limit of targets that you can easily hit without doing a lot of collateral damage," he says. If Moscow decides it needs a bigger operation, possibly with Russian boots on the ground, it could find itself — in Pifer's words — "in an unhappy quagmire."